We're in February and I'm making my first proper post of 2019. If you've been checking back every so often in the hopes of a new post: sorry! I'm not going to let this blog die, but I do need to prioritise other things at the moment. Here's a reminder that you can keep up with more regular snippets from my life on Last.fm (I'm determined to keep fanning its flame!! ), Goodreads, and Twitter. I'm writing this from my old bedroom at my parents' place, with a view of the sunset. God, I love being out in the country every so often. I've come to stay here for a few days to weather the transition between January and February, two particularly gloomy months. Before long, it will be March, and then Br*x*t will kick in (a news segment on the U-Bahn TV last week optimistically said that it was "planned" for the end of March). This will be my last visit to the UK before life changes — I'm not prepared to run the risk of not being let back into Germany once I technically have no official status there. Two-and-a-half years ago, I was freaking out. But now, even though things are still uncertain this late in game, and I'm still furious at the circumstances that led to this referendum even coming about, I've taken stock of my blessings and I'm really just taking every day as it comes. In a strange way, it's made me appreciate everything I have a lot more, especially when I consider the hardships along the way and how close I came to giving up. So far in this new year, I'm feeling invigorated in ways I've never been before. I attribute this to several things, like setting boundaries, taking the right medication, pursuing freelance work leads more relentlessly and reaping the results, eating better, establishing a regular sleep routine, and spending extra time with people who nourish me. Anyway, this preamble is beginning to resemble a food blogger's life story before they get to the actual recipe. Here's a post I've actually had sitting in my drafts for more than a year, and I've gone back every so often to edit it. It's about a part of Mitte and Kreuzberg that I rarely see talked about. I've written about the strangeness of the Mitte-Kreuzberg border before, but I've become more and more intrigued by a section of it that is apparently off the radar to most people. It all started when I got lost on my bike on a spring evening sometime in 2016, on my way to Friedrichstraße via Moritzplatz. 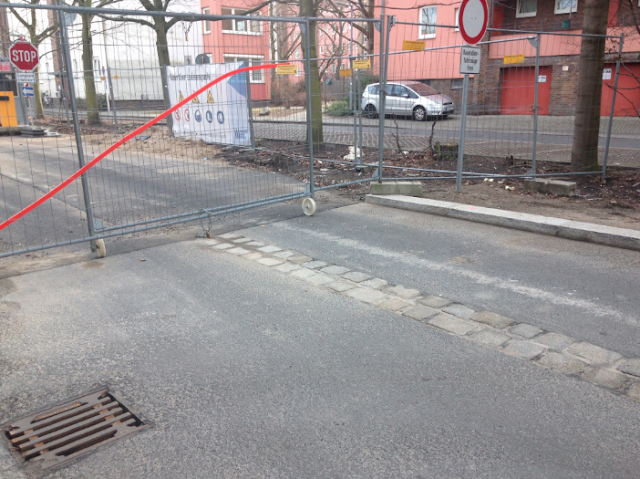 I decided to try a different route and ended up on some dead-end street, presumably somewhere behind Oranienstraße. There were some white, uniformly small-windowed residential buildings next to a Kita (daycare centre). I checked my phone's GPS, and was taken aback at how central my location in fact was — yet why had I never heard of Stallschreiberstraße? 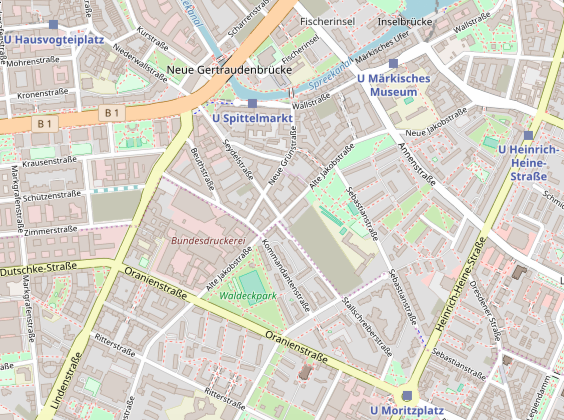 What lies to the west of Heinrich-Heine-Straße and to the north of Oranienstraße, the perfect right angle of streets on the map above? Whatever it is, it's tucked away out of sight and out of mind. Heinrich-Heine-Straße, which is in the former East, is lined with tall, blue-and-grey post-war residential buildings. The part of Oranienstraße west of Moritzplatz, on the other hand, has trees, a park, and post-war flats that still look just different enough to their Soviet counterparts. Of course, this relatively modern difference is exactly what constitutes the strange allure of this area, which is historically known as Luisenstadt. It was a workers' neighbourhood generally understood to be framed by the River Spree, the Landwehr Canal and former Luisenstadt Canal, and then Lindenstraße. The ghostliness factor is pumped up by the fact that this name probably wouldn't ring any bells today with your average Wahlberliner, as opposed to, say, Neukölln or Bergmannkiez. What's more, certain Luisenstadt streets have since been absorbed into the folds of history forever; see if you can spot the obsolete streets of Kürassierstraße and Mathieustraße here, for example. As it stands, I consider Moritzplatz, the point where H.-H.-Straße and Oranienstraße meet, to be a mysterious entity. The eponymous U-Bahn station is located right under the roundabout, and you walk down to a disorienting mezzanine before continuing to the rather dank platform. Behind at least one of the doors in this mezzanine, there's a hidden bunker. Finally, the station wasn't even going to be located there originally, but at Oranienplatz; the empty, unused station there was filled in a couple of years ago (go to the part of Dresdener Straße between Oranienplatz and Alfred-Döblin-Platz, and you can see where the tarmac was opened). Due to the change of plan, you'll feel the train screech as it hugs a 90° curve when you travel southwards, before chugging along the straight line of Ritterstraße and Reichenberger Straße towards Kottbusser Tor. Spooky. As we all know by now, the Wall has now been down for longer than it was up. And "Wall" is a bit of a misnomer; rather than one singular wall running through Berlin, there were in fact two, running more or less parallel, with a death strip in between. That means there was a lot of empty space and wasteland once German reunification rolled around. Yet until recently, there were still areas that carried the legacy of the Wall era that hadn't yet been covered up or put to use. They are becoming more and more scarce. Just north of Moritzplatz, Prinzenstraße confusingly folds into Heinrich-Heine-Straße with no fanfare. In fact, it is like this because it marked one of the biggest East/West checkpoints in the city. 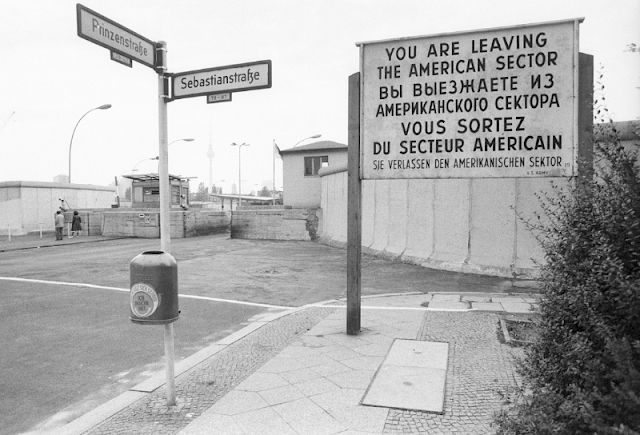 The border crossing from Kreuzberg into Mitte took up a lot of space. This is also a part of Berlin where very often, a single street could be trimmed through its middle into East and West: Sebastianstraße, Stallschreiberstraße, Waldemarstraße, Alexandrinenstraße, Dresdener Straße, to name a few. 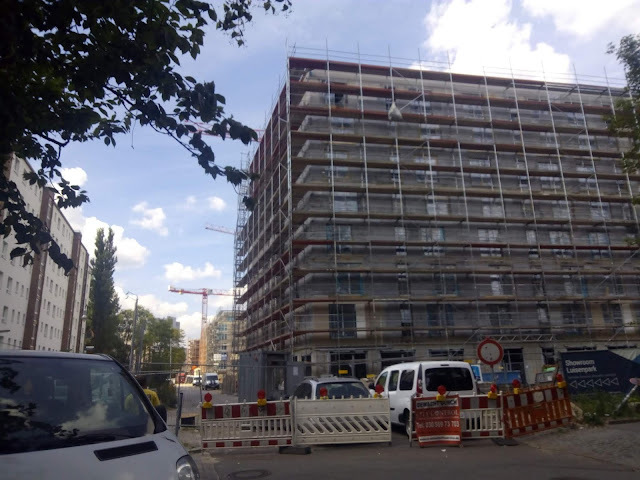 A photo of this corner from the early 2000s would depict a LIDL, a car park, and some West German residential buildings dating from the Wall era — these can be seen from the Mitte side of Sebastianstraße in this footage. More recent developments in this ex-death strip space include the construction of luxury apartments. Going back towards Moritzplatz, the Otto-Suhr-Siedlung is located on the northern edge of Oranienstraße. Named after the mayor of West Berlin at the time of its construction in 1957, this housing estate is counted among the poorest in Berlin — but is also considered a key component of the city's post-war rebuilding initiative. Kreuzberg's huge Turkish population is no exception on the Otto Suhr housing estate. 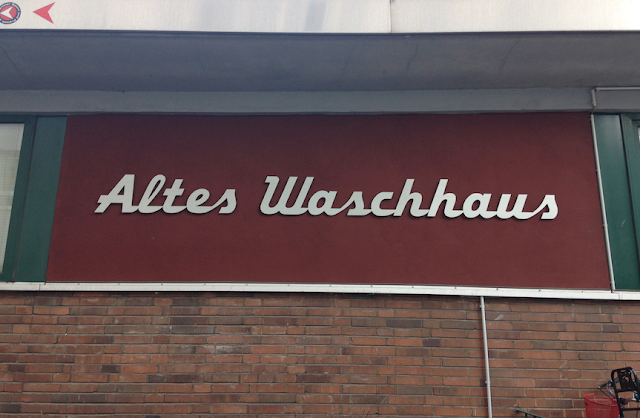 Originally a laundry room, this is now a sports centre and a place for Otto Suhr residents to socialise. The Kreuzberg stretch of Kommandantenstraße. Regular flats on the right, and if you look right at the end of the street, you can see the shiny new buildings in Mitte. Gentrification and rent hikes have been a bone of contention for Kreuzberg for a long time now, to the point where your eyes might glaze over whenever you glimpse a certain combination of words in news articles, on demo posters, and so on. In fact, sometimes it feels like you can't even mention Kreuzberg without immediately following it with the concession that it's "not how it used to be". 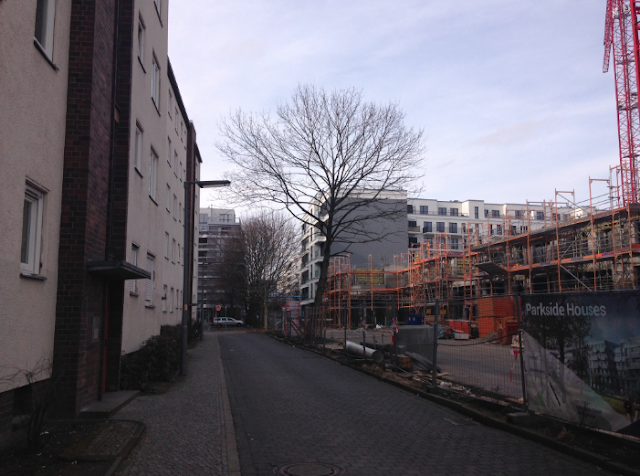 And despite being a rent-controlled area, even Otto Suhr is being threatened by investors. Keep walking to the end of Alexandrinenstraße and you'll meet the intersection with Stallschreiberstraße — and this is where the dissonance is quite astounding. On the one side are West Berlin-style flats, many of which are reserved for low-income residents or pensioners. Looking out onto the other side of the street, what a year ago was a complete wasteland next to a school is now a building site. So what is actually being built around the corner, across the road? 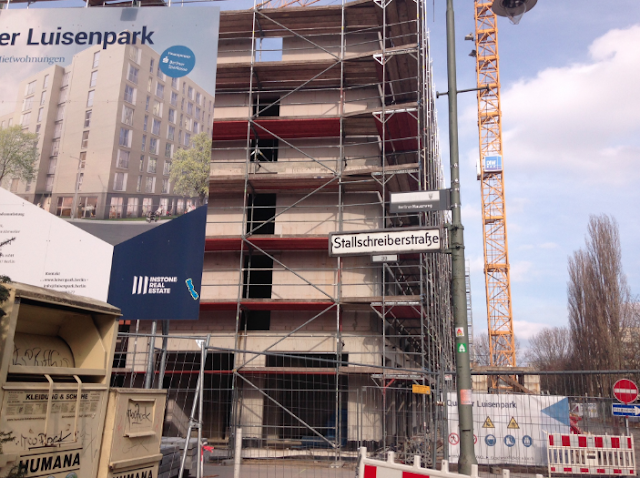 A bunch of apartments, destined, if the banners are to be believed, to form a new estate called Luisenpark. The apartments are fancy. They are for People With Money, never mind the fact that Berlin's problem is not just affordable housing, but available housing. Each week, it feels like I see a new incidence of residential buildings getting bought up by wealthy yet morally bankrupt developers and people being threatened with eviction. Building new houses under the poor's noses, yet making them economically them out of reach, displays a sickening greed and lack of empathy. Some of the new apartment buildings already exist and even have a few names on the doorbells. I could smell their newness as I went up close, a synthetic smell, somewhere between wood and plastic — a far cry from the mustiness of the Altbauten I'm used to frequenting. I felt a pang of jealousy, wondering what it was like to live with that kind of blitheness and trust; your apartment not yet even being ready for habitation, yet still dropping a couple hundred thousand on the deposit. That's a status I can't ever imagine myself achieving, frankly. Should I just make peace with that? 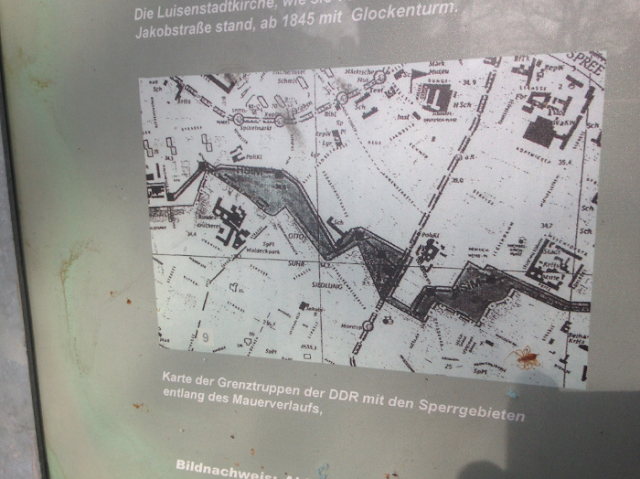 An old map of the area, found in the Luisenstadt Church Park. The dark bits are the death strip between the Berlin Walls. I do think there's acknowledgement, locally, that this is a twilight zone. Not to be confused with the Luisenpark project, the Luisenstadt Church Park commemorates the church that once stood there. Bombed during WW2 (killing 60 people who'd sought shelter in its basement), the church was fully demolished in 1964 due to lack of funds for reconstruction and its inconvenient location on the Mitte-Kreuzberg border, which was now the East-West border. Like the Luisenstadt Canal, the church another local ghost. It's hard to even find any likeness of it on Google Images, which instead yields various Kreuzberg churches, like St Thomas, St Michael and St Jacobi. While it's fitting, then, that new life is germinating on this former wasteland, what it actually means is saddening and also rather frightening. New houses that none of us plebs can actually inhabit is wasteland, indeed. The investor attitude towards Berlin seems to be this compulsive sort of "Why are there still areas that haven't been covered over? Quick, MUST COVER OVER!!!" and it's getting real old, real quick. By this point, it is a cliché that Berlin's a city consigned to becoming, not being. Only we're far past that romantic stage — which had its heyday in the 1990s and maybe the early 2000s — of building up grassroots communities and spaces that make the place interesting. Now it's more like people come here to throw money at attaining a perceived lifestyle, rather than actually thriving off it. Yet if the flipside of having a high-paying job is doing lots of overtime and travelling a lot (as I know it is wont to be), when are you going to have time to actually enjoy the great things Berlin has to offer? I don't understand, but I'm going to keep exploring these places until there's nothing left of them.